There is absolutely no reason to miss bread when you’re on a low carb diet. Thanks to the double miracle that is almond flour and coconut flour, you can make amazingly delicious grain free breads. Soft white rolls? Tick! Rustic, seeded buns? Tick! 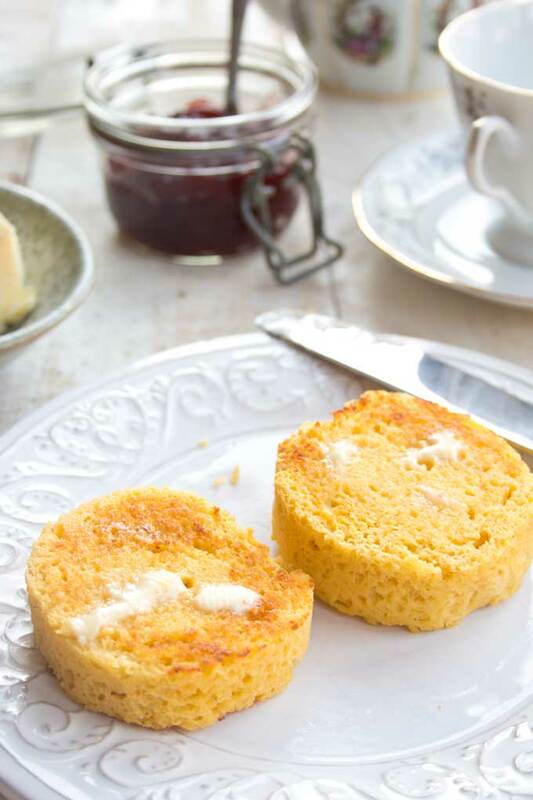 The most awesome thing about these gluten free muffins (apart from the taste, naturally) is that you make them in the microwave. I think the microwave is a God-sent for busy people who like to sleep as long as possible in the mornings! 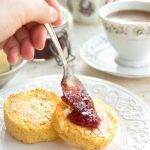 Keto English muffins require the same basic ingredients as my easy low carb rolls. I experimented a bit with quantities and ingredients – not a hardship when you have a finished product in front of you in a couple of minutes. In the end, I came back to my original measurements, with the addition of some almond milk to produce a delightfully soft, pillowy and light texture. The one thing that’s absolutely essential is to grease your ramekins/mug you bake your muffin in REALLY REALLY well. You don’t want half of your muffin stubbornly cling to the ramekin, even though it would still taste great. This is not supposed to be a mug cake experience! Keto English muffins should be sliced in half, toasted and eaten, in the most civilised British way, from a plate. with poached egg, sauteed spinach and sauce Hollandaise. 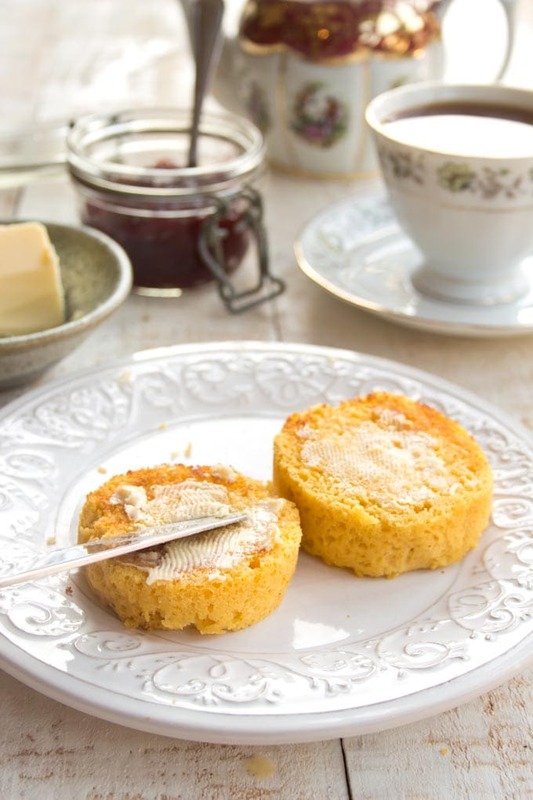 Click here to pin this low carb English muffins recipe for later! A simple, quick and delicious breakfast! 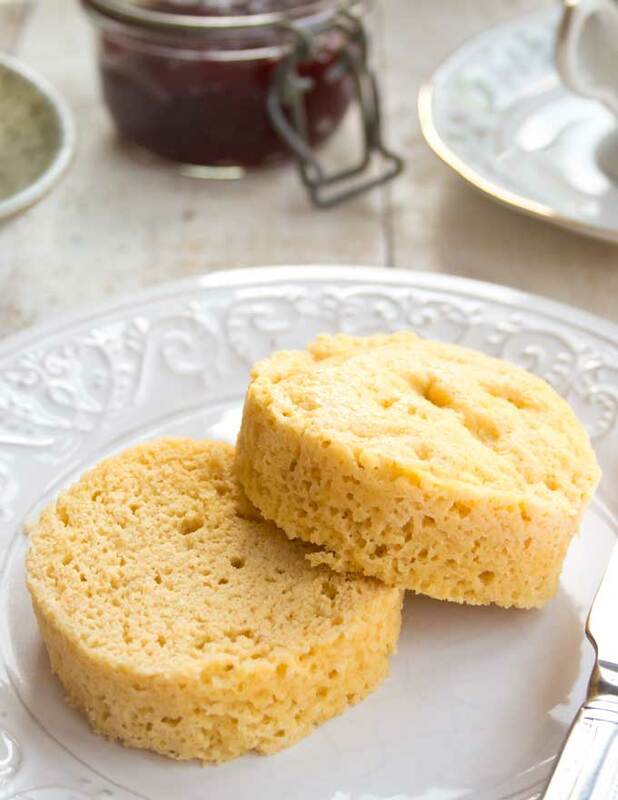 It takes just 90 seconds to make these easy low carb English muffins in your microwave. They are Keto, gluten free and grain free. Melt the butter in the microwave - this takes ca 30 seconds. In a bowl, whisk your egg. Add your melted butter and nut milk, then the almond flour, coconut flour and baking powder. Mix until smooth. If you wish, add a pinch of salt. 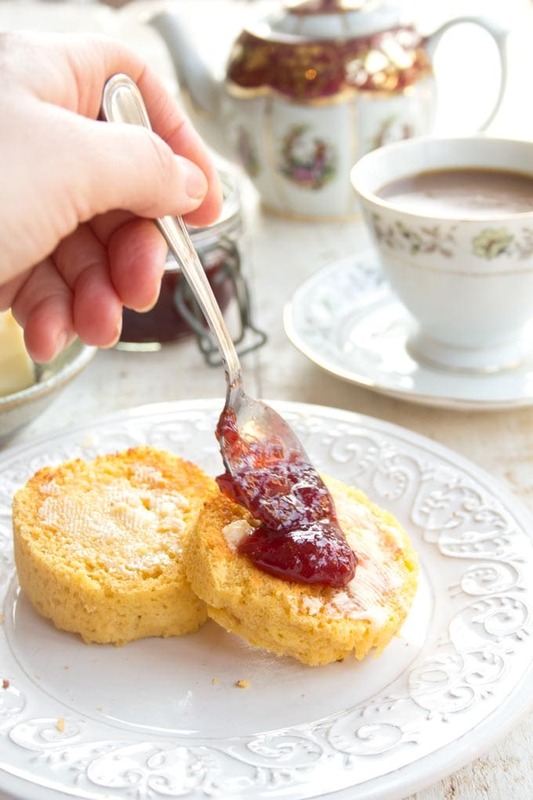 If necessary, run a knife around the edges of your dish and turn muffins over onto a plate. I made these low carb English muffins in a mug with a diameter of 7 cm. ****Update - I have since made them in classic ramekins like these with a 9 cm diameter which makes them a bit flatter but still tall/high enough to cut in half. If you make 2 muffins at the same time, increase the microwave time to 2 minutes. These are great! Just stumbled on your website while looking for a keto pancake recipe for pancake Tuesday. Pancakes where awesome too! The English muffins were really good. I thought they would taste eggy but after I toasted mine, it tasted like bread. Thanks for having such a great site. I’ll be visiting often. These are really great! They toast up beautifully, even my husband thought so. 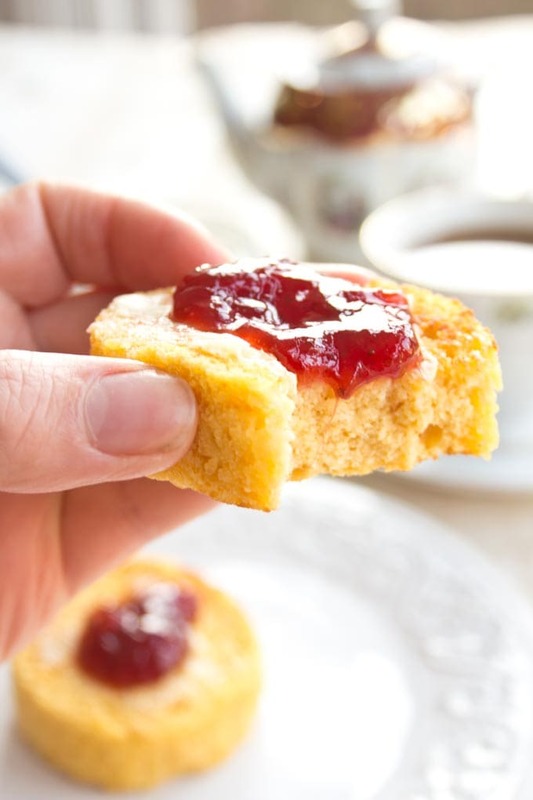 I had some clotted cream that I needed to use, so with a little bit of sugar free jam I had a yummy combination. Next time I will try (as suggested) some grated cheese and a few herbs…maybe even some garlic butter. Thanks for the recipe. You’re welcome Shirley! Glad you like the muffins. Thank you for another great recipe. 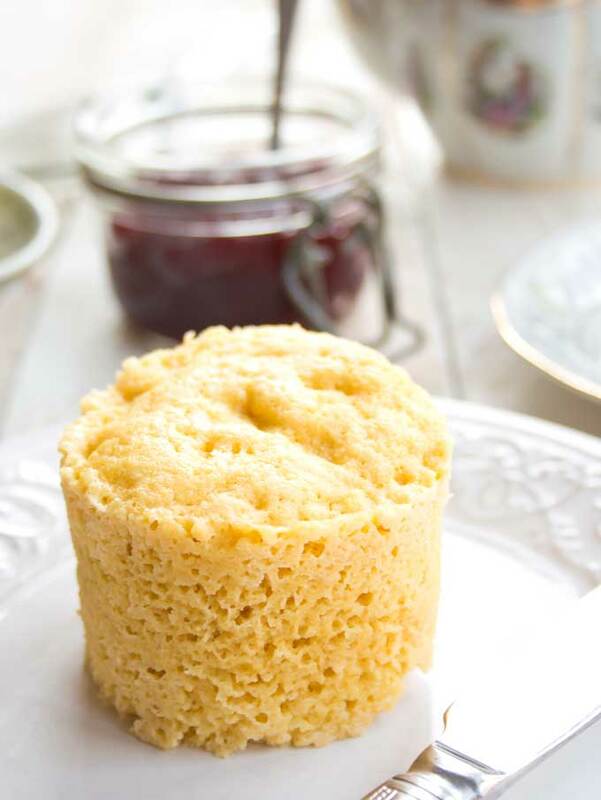 I’ve made other microwave breads and they are all dry and have the texture of old sponges. I had no almond flour in the house, so I used found flaxseed meal instead and it worked brilliantly. Tank for yur comment, good to know it works with flax! Awesome!!! I will try with ground flax too. We’re the measurements the same? Hi Catherine, I asked the other Katherine (with a K) above 🙂 I would use the same amount, but I haven’t tried myself. Hi Katherine, a reader wants to know if you used the same amount of flax as almond flour? These were really good!! Toasted mine and the texture came out just like real bread! No eggy taste, either — as others have noted! Will definitely make this again. Oh I love egg Benedict! Enjoy!! Great! So tasty, simple and quick. I divided the recipe into two small silicon muffin molds. It took the same 90 seconds to make but it was easier to divide with my husband 😀 Cut in half, toasted, one with butter, one with butter and pumpkin jam. Delicious! Can’t wait to taste one with olive oil and cherry tomatoes. this is a wonderful keto happy bread. Thank you! I enjoyed my muffin with some almond butter and sugar free jelly and it was so tasty and quick. I will use this recipe again and again. Super easy to remember the ingredients. Hi Katrin. I just made your easy low carb English muffin, and I made it in my microwave. Until today, I have always made my muffins/breads in the oven. What can I say? Yours is the best I have ever tasted! I kid you not. It did not smell or taste eggy. It was delicious. Mine did not have the same rise as yours; however, I was still able to cut it in half and share with my husband. He was speechless. It was moist, too, and I did not toast it. I have two quick questions. Do you think that I could add some cheese or spices for flavor (sweet or savory)? Also, would it be possible to mix up the dry ingredients and put them in small Ziploc bags, and store them in the refrigerator or freezer for later use? That way I could just throw it in the wet ingredients and microwave? Thanks for the recipe. It is a keeper! Hi LaWanda, thanks for your comment! I’m glad you like the recipe 🙂 Adding herbs or spices to it should be no problem at all. Grating cheese int the dough should work too, though it might make the end result firmer, especially if you allow the muffin to cool down. Storing the dry ingredients prepared in ziploc bags is a brilliant idea, especially for mornings when you want to switch on as little brain cells as possible :). I love it! Thank you so much for this recipe! I’ve tried other 90-second microwave “breads” before and they always left something to be desired: too eggy, too greasy, weird texture, etc. These, however, have a great structure to them, rise evenly, and the texture is lovely. Plus, they work well for both savory and sweet! For example, I made this today and topped one half with a little bit of cream cheese and some strawberry slices. The other half I cut in half again and used to make a breakfast sandwich of bacon, spinach, Mayo, and Dijon mustard. Both were YUM! Yes, these are not a perfect facsimile of a proper English muffin, but they do such a good job on their own that I don’t even care. Just made these for breakfast this morning! Served them with avocado spread and bacon, yum! Husband, son and mom approved. Thanks so much for the recipes! What a lovely comment to start the week on. I’m glad you like the recipe! Wow! I’m eating this right now and it’s amazing! Thank you so much for sharing this recipe! That’s great to hear! Glad you like the recipe!! Could you use just almond flour? I don’t have any coconut flour. I’m sure you could, but you’ll need more extra almond flour than just 1 tbsp. Maybe 1 1/2 tbsp of even 2 tbsp. Just mix it up and see that it gets a nice doughy consistency. Thanks! I’ll give it a try and let you know! oh my goodness – this turned out perfect – I used avocado oil instead of butter, and egg whites – toasted it up in my air fryer – Perfection! What an interesting twist to the recipe! I’ve got some avocado oil at home but have never tied baking with it. Thank you for the inspiration! These are so good! They were perfect for a fried egg sandwich and i can’t wait to make them again with strawberry jam. I’ve tried several English muffin in a mug recipes and they were terrible so I almost didn’t try this. I’m so glad I did. Thank you for a fantastic recipe! You could use coconut flour, though you’d need to change the quantity – half is probably enough. Leave the dough a couple of minutes for the flour to absorb the moisture and see if it has a good consistency – not runny like pancake batter, but nice and gooey. Looks delicious What’s the jam you are using in the picture? Hello Emma, it’s homemade strawberry jam – I just cooked up some strawberries with a bit of lemon juice, vanilla and powdered sweetener. They were great. So moist and soft and bread-y. I made a big batch and have been toasting them straight out of the freezer. That’s exactly what I have done – always wonderful to be this prepared!! For those of us who do not own a microwave, how would we do it in the oven? Hi Cathie, you could try it at 180/360 Celsius for around 12-15 minutes, check that the middle is firm. Can you use something else instead of the almond milk? I don’t like it. Do you think they would taste nice with some sweetener? If you wanted a sweet muffin, you could add some. I find that the coconut flour has some gentle sweetness to it already though, so you might find you don’t need extra sweetener. I made your microwave lemon cake recently and loved it. These muffins are just as nice and delicious toasted. I added a bit of salt to the recipe because I prefer my muffins with eggs. I like that they do not fall apart when you butter them. Amazing recipe! These muffins had a wonderful texture. Not dry, not eggy, simply delicious. Thank you!